Line joining points of equal or same elevation called contour lines. Difference of elevation between two consecutive contour is called contour interval.Contour interval is kept same for a map .So that the different features can be identified just by looking at map . 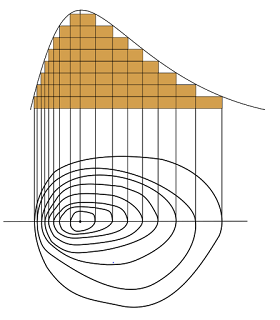 Distance between two consecutive contour is called horizontal equivalent. 1> If counters are parallel to each other and the distance between them are also constant .It represent uniform slope. 2>Closely spaced contours represent steep slope,however distant contour, contours represents relatively mild area. 3> If the contours are closed then it represents either a hill or a pound. 4>Ridge line or valley line intersects counter at right angle. 5>Two counters of different elevation neither cross each other nor join. If reading are increase toward centre ,it represents a hill.However, if it is decreasing toward centre ,it represents a pound or valley.